Have you ever seen a trail of ants going from one destination to another? They seem to have a great sense of direction and are intensely focused on where they are going and what needs to get done. Even though ants are responsible for so many tasks, they always seem to accomplish everything they set out to do. Because of their success principles, if ants were human, they would be the most successful group of people on the planet. So how is it possible that such a tiny creature can achieve so much? I once heard speaker Jim Rohn talk about the ant philosophy. He explained their ability to never give up and how they prepare for the future. I decided to take a closer look the ant and found that there are many more principles that they live by that, if applied to the human life, would almost guarantee success. Ants are remarkably persistent. If they are on their way somewhere, they are focused and determined to get there not matter the obstruction. They often scale great heights and travel long distances in order to get to food. No obstacle is too big to conquer. If an ant comes across a morsel of food too big to carry, it will find a way to summon other ants and they will work tirelessly until they have broken the food down to a size that is more manageable. Fearless persistence means fighting each challenge to the end. It means looking at the things that are in the way of your goals and resolving to overcome it no matter what! It may mean going under, over, around, and through just about anything to reach your destination. Just like an ant, you cannot let the size of the obstacle stop you from reaching your goal. There is no other group of animals that is more efficient, effective, and motivated. They seem to always be focused and working towards the common goals of building and repairing the nest, collecting and distributing food, and caring for eggs. But although they have a queen, she does not direct the actions of the other ants. While we humans need supervisors, bosses, and presidents to motivate and guide us, ants seem to be driven by an unseen force which propels them to continue to work towards the common goal. Being self motivated is an amazingly powerful trait to posses. Without the motivation to fuel us, it may become very easy to slip into the realm of boredom. While ants seem to need no outside motivation to drive them, we tend to need motivation from outside sources in order to complete our lifelong, and sometimes, our daily goals. Ants know how to focus on what is important to themselves and the colony. In order to stay self-motivated, we need to identify what is truly important in our lives and the lives of the people around us. Making a difference and contributing to a bigger cause is one of the best motivating factors we can have. Define what is important-Create a list of things that is important to you. Narrow the list down to the few truly important things in your life. Then, post that list anywhere where you will be able to see it often. Being reminded of what is important will keep you focused and motivated. Know ‘why’-Motivation usually comes from purpose. A person is more likely to do a task or challenge with enthusiasm if they know why they are doing the task in the first place. When it comes to your goals and your path to success, make sure you truly understand why it is you want to reach that goal. Choose you colony-Having the right type of people around you is a great way to stay motivated. Motivated people tend to motivate others. When you are surrounded by positive people, you are more likely to get and stay motivated. Being a very social insect, it is important that ants be excellent communicators. Their ability to communicate quickly and clearly improves their efficiently and productivity. Ants can communicate with each other in many different ways. Pheromones-Ants have a number of glands that are used to warn of danger, recruit sister ants, and mark territory. Touching-Ants often touch antennas while entering and leaving the nest. This is so they can better identify the ants that are from the same colony. Sounds-Some ants give off a high pitched squeaking sound that is made by rubbing the parallel ridges on the abdomen. The sound is very low but can be heard by humans if the ant is close to the ear. Gestures/Dancing-Weaver ants add to their communication with a series of gestures and even a little dance. Just like the ant, we have many different ways of communicating also. Along with our voices, hands, and body language, we also have tools such as letters, email, and text messages. In order to gain the same type of effectiveness, we must use learn how to use our forms of communication. Presence– Some people seem to have a strong presence about them. The ability to project a sense of ease, poise, or self-assurance is a powerful way to communicate. Those with a strong presence are more likely to have their message received in a positive way by others. Voice-Voice projection, speed, and clarity are important parts of communication. Your message is lost if you cannot be understood. Fine tune your voice by practicing different ways to say the same line by changing the rate, pitch, and volume until you find the one that is the most effective for you. Words-Choosing the right word to say is an important part of communication. Build your vocabulary and add some new phrases to your arsenal in order to precisely deliver the message. Gestures-The gestures that you make should reinforce your message. If you are confident, then your body should indicate that message. We as humans watch other people’s gestures to determine their moods and feelings. Be sure that your gestures are helping you convey the message you would like others to receive. And if you need to add a little dance to get your point across, go ahead. Being versatile is one of the major strengths of the ant. Without a ‘human resources’ department or a skills assessment evaluation, ants take on the role that they are best able to do depending upon their size, strength and age. Although they assume a certain role, they are able to step in and do any tasks that need to be done. For humans, versatility is also a great skill to have. In sports, the player that is able to play more than one position is seen as more valuable to the team. The same is true in the workplace. The employee that is able to step in when an associate is unable to work and effectively do their job is the type of employee organizations love to have. Being flexible and versatile will also help you balance your life. We often assume many roles in our lives. You may be a husband or wife, business owner, employee, student, community leader, etc. Since we jump in and out of these roles every day, it is important that we are able to handle them effectively so that one part of our life does not get neglected. Just because you were born with a certain skill set doesn’t mean that you should assume that position for the rest of your life. It is important to learn new skills and apply those skills to your life. 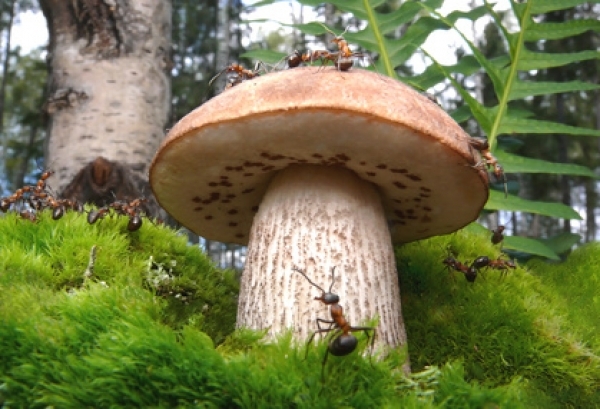 Ants understand the importance of using organized team work to get things done. Doing things in an organized group makes things much easier and efficient. They are able to build and rebuild in no time, capture prey much bigger than they are, and fend off enemies while protecting their queen. The entire nest is a smoothly run system where each ant is helping each other in order to fulfill the needs of the colony. Much like ants, teamwork is an important part of our success. With an organized team at your side, you may be able to accomplish anything. Being a part of an organized team helps reinforce individual capabilities and makes it easier to execute plans and distribute the workload. Any business or organization can benefit when the teams are operating in an organized manner. Having an organized team can also help you reach your personal goals. For example, whenever I decide to reach a new physical goal such as run a race under a certain amount of time, I will organize a group of people who I can train with. I try to recruit a diverse group of individuals. I will have some people who weight train, some long distance runners, and some who are good sprinters. That way, when we train together, in the different areas, there is usually someone who can show the team the best practices. Whether it is in business, family or sports, an organized group of people can get much more done, the right way, in half the time. Have you ever heard a song on the radio that you liked and a few months later, the song and the artist seem to disappear? One of the true measures of a successful person is being able to stay successful for a long period of time. Short term success is forgettable and easy to do. This is why most people do not consider musicians who have had only one hit truly successful in the music business. For an insect, ants can live for a very long time. The life span of the average insect is usually very short. Mayflies live for about 1 day and an adult bagworm moth live for just a few minutes. The ant, however, can live for years. The record for the longest life of a queen ant is 28 years! There are many ways we can learn to have longevity by observing the ant. First, being a social insect may lengthen the life span. Most social insects such as bees and termites tend to live longer than their solitary counterparts like the cockroach and moth. For humans, being social is also very important and can dramatically improve the quality of life. We can also learn from the longevity of the colony. Ants will do whatever is necessary in order to protect the queen from danger. They know that the queen is the most important component to the survival of the colony. In our lives, it is important that we protect the values that are important to us. Your skills, principles, and ideals are at the core of your being. Protect those things with everything you have because, just like in a colony, if the most important part of you is destroyed, so does your potential to succeed. Humans cannot be ants but we can learn much about accomplishment from them. They are hard working, social, and persistent. Take a few lessons from this mighty insect and see the impact it can make in your life.